Past workshops, Demo paintings and the wonders of masking fluid. Is it the cold weather or is it that nasty recession thingy… or is it me???? Not had a whole lot of feedback to my reminders about Spring courses. The classes are filling up slowly but surely but I have put an advert in the local free newspaper just to help spread the word. 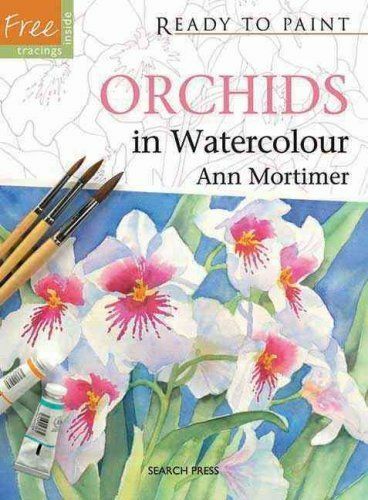 I sent off the “roughs” of my paintings to the publisher for the orchid book and am now looking forward to March and the trip down to Tunbridge Wells to do the step by step demo paintings while being photographed. I found this to be a good experience when I did my first book. I like demonstrating paintings and have no problem painting while someone watches. But there is more to it than that and a lot of care has to go into the preparation and design of a piece so that the readers can get the most out of following the different steps. You have to have thought about your colour mixes and have rationalised them to be the most economical use of paint in the palette. No stopping halfway and changing your mind about a colour or just adding an extra colour for fun! You have to generally make the painting “do-able” and cannot let yourself go into complete spontaneity. So it has to be quite measured and disciplined. 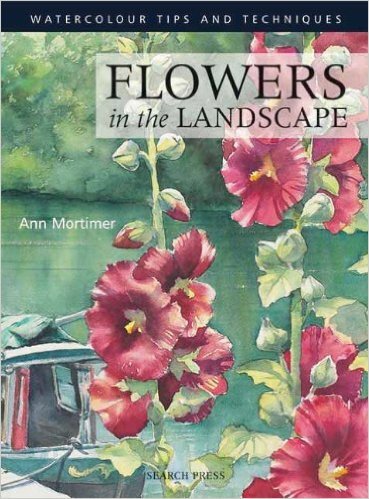 Which is why the other day I had a sudden desire to let myself go and use masking fluid on the primroses painting, gallons of it, to completely mask out the flowers and then have fun in the back ground. I generally tend to avoid using it too much with students as they are apt to be frightened of it. Unless you use it often, as I have been doing over the years, you tend not to believe that it’s best to put a good thick layer of it on the paper. But that is the best thing to do as it comes off very easily then. But I digress. 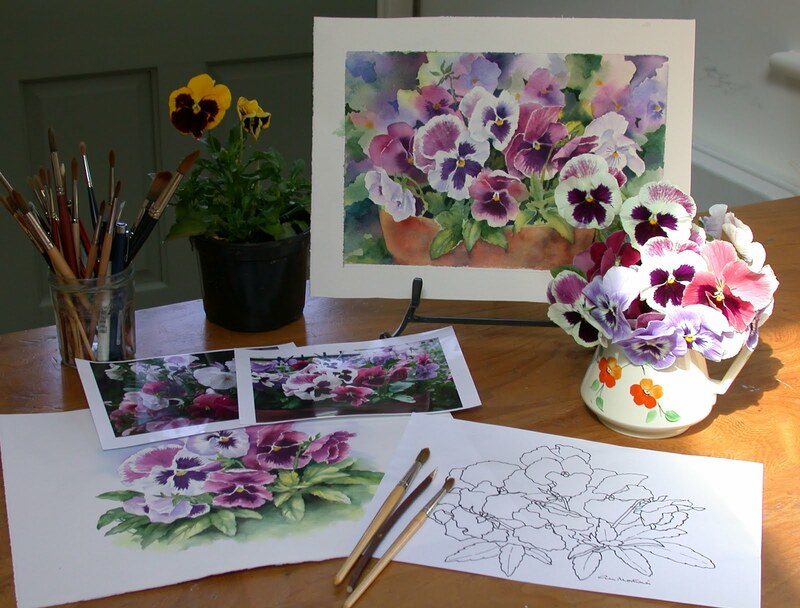 The photo I’ve up loaded for you today was taken after a Pansies workshop. 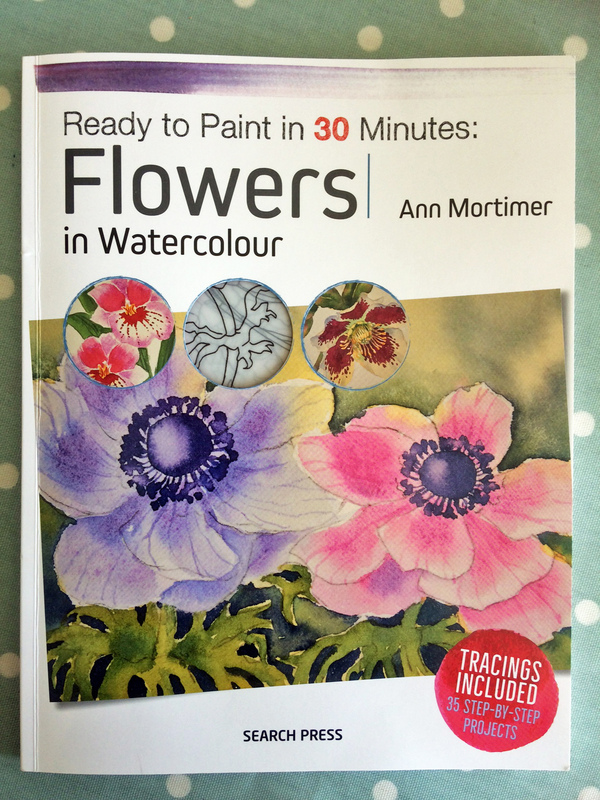 It summarises a workshop…drawings, photographic reference, real flowers, painting materials and the finished painting. Pansies are such perfect little flowers…they have inbuilt contrast with those splodges of dark on their faces as though smeared with blackberry jam! 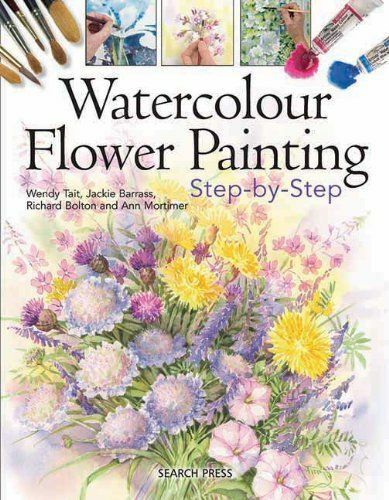 Gosh I can only imagine the amount of prep required to write an art book – quite an undertaking – I wish you much success!